Let One IT Support and our fantastic computer recycling services help you to dispose of your old pieces of technology quickly and in a safe manner. With new equipment entering the electronics market on an almost weekly basis, there will always be the temptation to update a device that you have had for many years with a gadget that is only just being launched. Fortunately, recycling computer equipment that you no longer need can be done easily and in rapid fashion thanks to One IT Support. Our technicians are on hand to take old desktop computers off your hands, as well as any screens or monitorswhich came bundled with the machine. We also accept any old laptops and printers that you have lying around, as well as a portal for the safe disposal of empty inks and toners. We offer excellent PC recycling solutions here at One IT Support, so that you can dispose of your old desktop computer safely and without any fuss. Due to the size of most desktop PCs, having one lying around a home gathering dust means that the device is just going to take up a lot of space as it sits unused. Fortunately, our friendly team of engineers will be more than happy to take your old PC off your hands through our handy desktop recycling services. We can recycle your unwanted screens and monitors upon request too, though be sure to check out our superb PC repair service if you have a feeling that there is still some life left in your cherished desktop. Discuss the options available to you with one of our engineers over the phone without delay, or drop your old PC off at our Tynemouth workshop if you want the device disposed of quickly. Dispose of your old laptop quickly and efficiently, thanks to One IT Support and our brilliant laptop recyclingservices. With laptops becoming more advanced with every passing year – not to mention the growing popularity of tablet computers – your old portable device could now be sitting in your home gathering dust. However, our engineers here at One IT Support are available to take your unused laptop off your hands and recycle it for any important parts it may still have functioning. 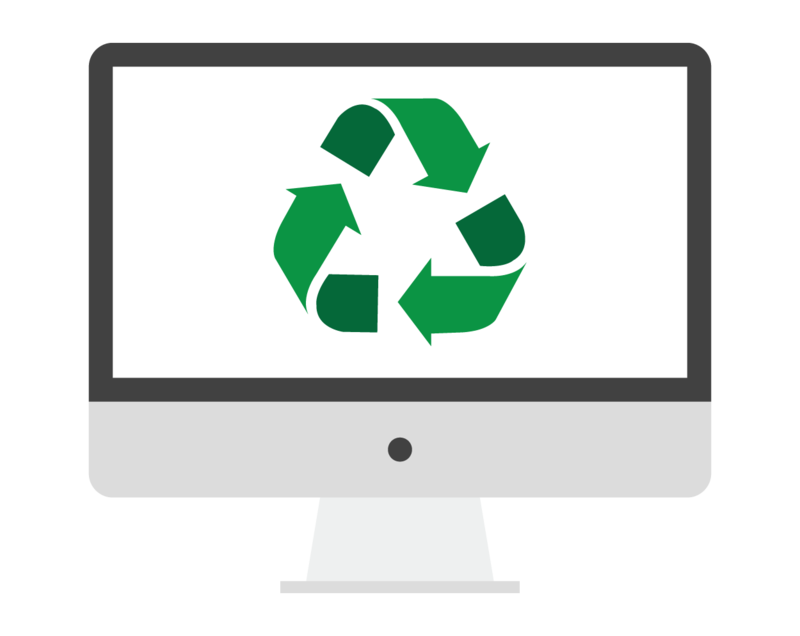 All you need to do to recycle your laptop is to get in touch and tell us the best time we can pick up your old gadget. Feel free to call round our Tynemouth workshop, if you prefer. Mind you, if you have neglected your device due to it being non-functional, be sure to check out our amazing laptop repair service before letting it go. Our skilled technicians have experience fixing even the most complex of problems with laptop screens, laptop keyboards and any power socket arrangement. Let One IT Support and our exceptional computer monitor recycling services help you to quickly dispose of your old screens and monitor, and in a safe manner too. If you have already opted to recycle your desktop computer, there is little point in keeping hold of a computer screen or monitor if you are not intending to purchase a new desktop unit in the future. This is where One IT Support can assist. We are able to recycle computer monitors and screens that you have lying around, no matter its shape or design. While you are on the recycling drive, we also offer fantastic solutions for disposing of your old printers and laptopsas well. So what are you waiting for? Contact us and arrange the best time for us to pick up all your unwanted tech without delay. Our excellent printer recycling services here at One IT Support will guarantee that your old printer is disposed of quickly and efficiently. In this day and age when the world is much more connected, emailing information or passing over data via memory sticks are now usually preferred over printing out documents and submitting them to recipients by hand. As a result, you may now have a printer lying around your house doing nothing else but gather dust. Let One IT Support help you out if this is the case. We recycle printers of any make, size and model, so you can free up some space around your home office in a flash. Don’t forget to recycle your empty printer inks and toners with us as well – our technicians will ensure they are disposed of safely and without any risk. Get in touch to organise the best time for our technicians to pick up your old printer without delay. Protect the environment and dispose of used printer inks and toners without any hassle, thanks to One IT Support and our superb ink and toner cartridge recycling service. It can be so easy to just throw an ink or toner cartridge into the rubbish bin as soon as it goes dry, but opting to recycle them will mean less materials need to be sourced to assemble new cartridges. One IT Support can assist with this process. Our technicians are on hand and ready to collect your used cartridges at a time that best suits you – just get in touch with them today or why not drop by our new Tynemouth workshop? Once you have made use of our fantastic ink and toner recycling service, don’t forget that we also stock top-quality inks and toners from all the big-name brands, so you can easily keep on top of any printing demands.